I love Halloween. Dressing up and pretending you are someone else is just so fun! 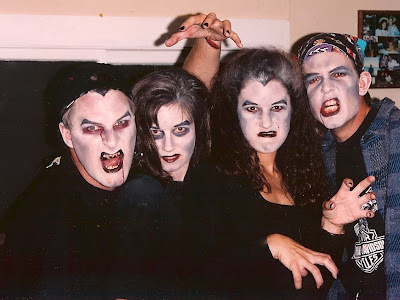 Anyhow, one year (1995 I think) I dressed up like Dracula. 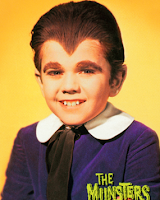 I was really proud of my cape and outfit - but everyone thought I was Eddy Munster. NO! Oh well. I guess I did kind of look like little Eddy - but he didn't have a cape! See? The funniest costume that year was worn by our copywriter, Eric. He dressed up like ME! He wore a pink suit, pantyhose, heels, a wig and a big band-aid on his forehead. (I had recently had a mole removed from the middle of my forehead and had to wear a band-aid for a few days.) IT WAS FRICKIN' HILARIOUS. I almost died laughing. People were worried I would be mad. NO WAY. It was awesome! I wish I could find a picture to show you. Just imagine a horrible suit from the 80's with huge shoulder pads, gross pantyhose, big Texas hair......too funny. Elli and I recently found this old picture from about 1993 I think. Don and I went to Santa Barbara to visit my sister and her then boyfriend (now husband) Mike. We didn't have costumes. So we made up our faces and went to State Street to hit some bars and scare people. It was a blast. Don, me, Kathy and Mike - woaaaahhhhh! I don't have any halloween costume ideas for ya'. But I did find some yummy treats on some websites that I thought I would pass along. So here you go. Check out all these cute ideas for your Halloween party! 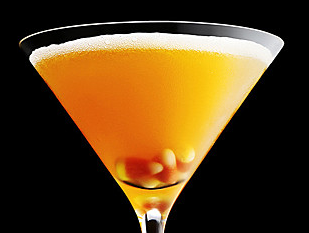 First, Cocktails! 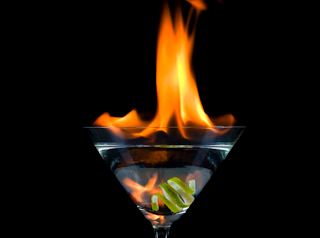 Click here to learn how to make cool drinks like these on the FOOD2 website. Now some treats for the kids!!! 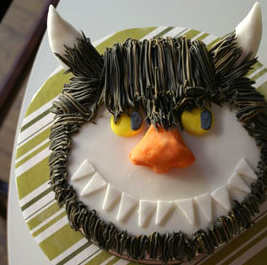 Where the Wild Things Are cake from Coco Cake Cupcakes bakery in Vancouver. 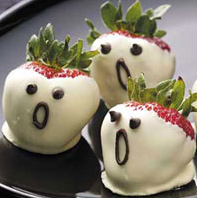 Scary little strawberry ghosts from TheKitchn. 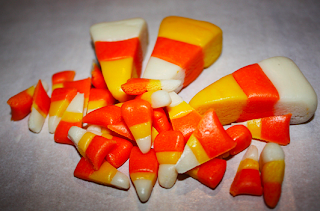 How about some home-made candy corn? Elli is going to be dressing up as a Pink Lady (like in the movie Grease.) She looks so cute in her costume. I can't wait to take pictures. Have a fun Halloween! Don't forget your new trick-or treat chant. Wow! I had forgotten all about that night! So fun.